T/N: mu-mo MAGAZINE is a free service which you can access through the Japanese cellular phones. The double A-side single, which you can see two different faces, is completed! Q: This time, the single album is double A-side, what are the contents? A danceable song with western touch, and a ballad. I wanted to sing both kinds of songs from before. The album is completed so that you can see XIAH junsu’s different styles in one single album. Q: What did you take care during the recordings? I thought more about the contents of the lyrics than before, so that I can completely devote myself when singing the song. Q: Junsu-san, you have been noted for your skill as a singer. Do you have any special ways in order to maintain your vocals? My spirits will go down if my throat hurts, so I take care to avoid such situations. When I think that there may be problems with my throat, I try to keep silent, drink water, and gargle my throat with vinegar and salt. Q: We heard that your twin brother Juno performed his showcase live in Japan in April. We heard that you also performed on stage. Did you give him some advice? Q: You have made your debut as a musical artist by “MOZART!” this January in Korea. You have expanded your activities, so that do you want to do in the future? Q: It is 6 years after your debut in Japan…since you had many opportunities to go nationwide during your tours, where are your favorite places in Japan? I like Shimoda Onsen in Kumamoto! (T/N: hot spring in Kyushu area) Oh, I just love Hitsumabushi in Nagoya. I think Odaiba (T/N: Tokyo) is always beautiful! Q: Last of all… please give your message to the Japanese fans. This is XIAH junsu! I am able to meet all of you in Japan after a long time. I want to express my gratitude to the fans who were waiting. I want to show all of you XIAH junsu, who will convey new music! Please support me!! 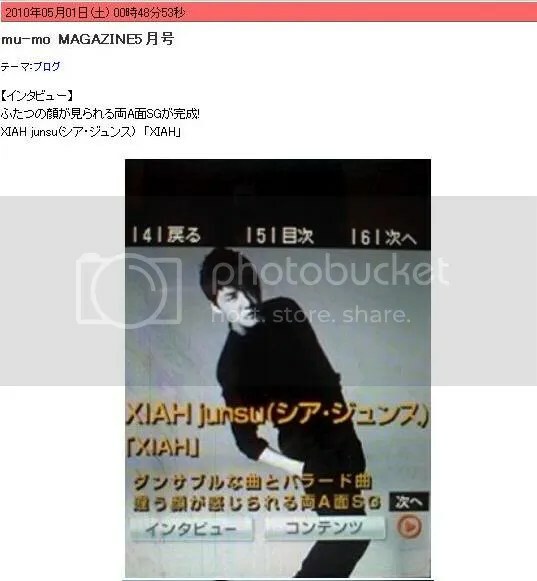 This entry was posted in DTL News Preview and tagged junsu, Mumo Magazine. Bookmark the permalink.